School is starting at the end of August and the rush is to find cool school supplies for your back to school needs. Regardless of what grade you or your prized student is in, there are basic school supplies that everyone needs. Executive Essentials has a plethora of pens, pencils, backpacks and laptop sleeves to suit any taste and price range. But those supplies only cover the learning portion of the school day and leave out the most popular ‘class’ that is loved by all: lunch. In nearly every town in every county, there is a choice to be made when it comes to eating at school and that is whether to eat hot lunch or ‘brown bag’ it. For most kids, the choice comes down to simply whether or not they like what the school is serving on that particular day. Pizza? Yes, please. Tacos? Count me in. Turkey and gravy on white bread? Maybe not so much. And, on those days when your student puts their nose up to what’s on the menu, you head into the fridge to whip up a quick PB&J or another quick sandwich that can get your little Einstein through the day. But the world of brown bags (and for the most part, metal lunch boxes) are gone. These days, reusable lunch totes and fabric lunch bags are as advanced in their design as backpacks and messenger bags. Many are lined with waterproof fabric, are easily cleaned and are built to keep the cold, cold and the hot, warm. Here at Executive Essentials, we have a good array of lunch bags and totes that can keep your student not only well fed but looking stylish as well. This Scout Bags Doggie Bag Tote is a prime example of style for the right price. It is ideal for school and the beach and is a decorative must-have everyday lunch bag that is irresistible and reusable. The simplicity of this bag is what I like most. Made of coated polyester and fully insulated, this nicely sized lunch bag has a simple handle and a Velcro closure that will secure all items stored inside. A nice feature about this tote is that it expands at the top when opened for easy access to the contents within. Check out this Scout Bags Doggie Bag Tote for the boys as well. This extremely durable and long lasting lunch bag is made of neoprene and comes with a warranty against manufacturer’s defects. The neoprene fabric allows the bag to stretch so you can really pack it full, although at 13.5″ x 13.5″ x 7″ you shouldn’t need to stuff it too much. The soft grip handle is built right into the bag making it strong and comfortable all at the same time. And what’s even better is this bag is machine washable, stain resistant and comes in black, red or pink. Very cool. For those who want to bring a bit of sophistication with them to lunch, I’d suggest this lunch tote by Clava. Made of leather and coming in either brown or black, this stylish lunch tote almost defies the term lunch bag. In addition to being roomy and tall, this rugged tote has an interior pocket to secure smaller items and a double shoulder strap with a 12 ½ inch drop. 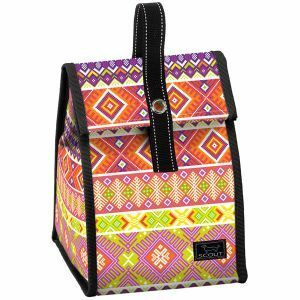 My daughter (10 years old) just commented that out of all the lunch sacks available at Executive Essentials this is her stand out pick. It may have something to do with the large daisy emblazoned on the outside. She also commented, “it doesn’t really look like a lunch bag.” I agree. This tote created by Harold Feinstein has all the features of a great reusable lunch bag, captured in the style of hand bag. The shape and design are done in polyester and nylon for durability and cleaning. The insulation keeps food warm or cold and it has an exterior zipper pocket for smaller items. The best part about the reusable lunch totes at Executive Essentials is that they are all part of the back to school sale going on right now. With 14 lunch sacks to choose from your guaranteed to find something you like at price you can afford.